When you visit our office, your experience should be pleasant, affordable, and rewarding. These things don’t just happen – although, in our office it often seems that way. We’ve gone to lengths to ensure that our patients receive the level of care they deserve in a carefree environment. If you have any questions about our comfort amenities, technology, or financial policy, don’t hesitate to call the office for a detailed explanation. Because of our dedication to all new and returning patients, Southridge Dental was recently voted the #1 dental practice in Denton County in a survey by Denton Co. HHR. New patients typically spend an hour and a half getting to know Dr. Dunson. This visit often includes a comprehensive exam and a professional cleaning (in the absence of gum disease). Dr. Dunson may take intraoral photographs and show them to you on our chairside monitor. He’ll also make recommendations for treatment and offer educational tidbits that will help you understand the reasoning behind his suggestions. Before you leave, we’ll schedule any necessary follow-up visits and offer you a cup of coffee, a refreshment, and a smile! As a certified sedation dentist, Dr. Dunson safely and effectively calms anxious patients and encourages deep relaxation. Patients with complex needs and a limited time frame can also benefit from sedation dentistry. State-of-the-art tools, such as air abrasion (drill-less cavity preparation), minimize discomfort and enhance the overall experience. Oral Sedation – A pill prescribed prior to your visit alleviates tension and promotes a restful visit. Nitrous Oxide – Nitrous oxide, or laughing gas, is inhaled through a nasal mask for instant relief. Air Abrasion – An alternative to the traditional dental drill, air abrasion quietly whisks away decay without heat or vibration. Television & Headphones – Sometimes a little distraction can work wonders for your peace of mind. With the latest in dental technology and several cozy amenities, you’ll be sure to feel right at home at our Denton office. 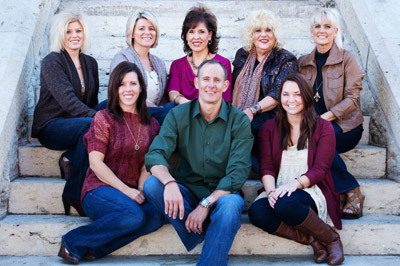 Take a look at some of the smiles Dr. Dunson has transformed for the better! You’ll be dazzled by the results. Our staff members are experienced, dedicated, and always friendly! They love giving patients something to smile about.